Welcome back from the Labor Day holiday. Summer is sadly over, but we are excited to be back as this time often marks the start of a rush of biotech news that will play out over the remainder of 2017. Biotech stocks can be quite catalyst driven. As an investor, it helps to know the important dates that might impact companies. These include important medical meetings, clinical trial schedules, and other key events where you can expect to hear news from companies. To help our investors make sense of it all, we scoured the second quarter earnings releases of companies in the Cancer Immunotherapy ETF (Nasdaq: CNCR) and have listed below their stated immunotherapy catalysts for the remainder of 2017 all in one place. While you can be sure to see a healthy dose of unexpected news as well, the below events should at least give you a snapshot of what the companies are stating as their most important catalysts coming up. 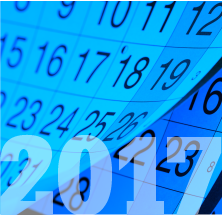 First, it is important to know what medical meetings will be impacting cancer immunotherapy companies throughout the rest of the year. Medical meetings are key to biotech investing because it is at these meetings where companies aim to announce their most important clinical trial results. Be sure to circle these dates as moments where you can expect to hear a lot of news about immunotherapy. A consortium of cancer immunotherapy organizations hosts this conference and all of the research presented here will be about immunotherapy. You can expect to see both preclinical (before human testing) and clinical results discussed and presented here. ESMO is the largest meeting of cancer research held each year in Europe. This is a big one. Even though it has a European flavor, ESMO is a global conference and you can expect that companies from around the world (including many CNCR holdings) will be presenting important clinical trial results here. The Society for Immunotherapy of Cancer will be hosting its 32nd annual meeting in the Washington DC area this year. The conference has turned into somewhat of a central event for immunotherapy research and you can bet that many immunotherapy companies will seek to present data here. The Society for NeuroOncology is one of the most important meetings for presenting brain cancer and spinal tumor research each year. Immunotherapies such as oncolytic viruses, cellular therapies, and others are being researched heavily for brain cancers. Expect to hear news from immunotherapy companies with this focus at SNO. Celebrating its 40th anniversary, SABCS is always one of the most important conferences for breast cancer research. Immunotherapies are being researched widely for certain types of breast cancer, especially such as triple negative breast cancer, so watch for immunotherapy news to come out of San Antonio this year. ASH stands for the American Society of Hematology and it is the largest conference for blood diseases in the world. Since many cancer immunotherapies approaches like CAR-T are having a big impact on blood cancers, ASH has become one of the top two or three important conferences for immunotherapy. ASH can be make-or-break for certain companies and has often impacted the immunotherapy space a lot in the past so look for it to be newsworthy again in 2017. All biotech companies often provide in earnings releases and other corporate presentations a snapshot of what they believe are the most important news items and milestones coming up. We scoured the second quarter earnings releases of CNCR held companies and have aggregated this list of their upcoming catalysts for 2017 below. Enrollment is ongoing in 9 clinical studies with NY-ESO (in partnership with GSK) and across 12 different tumor indications for Adaptimmune’s wholly-owned assets (MAGE-A4, MAGE-A10, and AFP) with some data to be presented in 2017. Launch a phase 2 study in pediatric osteosarcoma with the Children’s Oncology Group. The phase 3 ARCTIC study of Imfinzi plus or minus tremelimumab in third line PD-L1 low/negative lung cancer patients will read out in the second half of 2017. If positive, a regulatory submission might also be completed by the end of the year. The ATA129 expanded access protocol clinical study for patients with EBV-PTLD and other EBV-positive hematologic and solid tumors is ongoing at more than 10 medical centers. Multicenter data from the EAP clinical study is expected to be presented at appropriate future scientific conferences. An IND will be filed for the next generation anti-BCMA CAR-T product, bb21217. A poster presentation for CA-170 (PDLA/VISTA antognist) will take place at the ESMO Conference in September. Thank you for reading our preview of cancer immunotherapy catalysts remaining for 2017. While we aim to arm our investors with as much information as possible about the immunotherapy space, it is our pleasure to do this research on your behalf and provide you with a consolidated way of investing in the theme of immunotherapy. Have a great rest of the year!